1. Bring to all fittings: Everything you plan to wear the day of your wedding including your shoes, bra, body shapewear, and petticoat slip. Since not having these things can cause incorrect adjustments, if you forget to bring something, I will have no choice but to reschedule the fitting. 3. Prices include your bridal gown fitting times. Initial fitting, second fitting (if necessary), a final try-on (at pick-up) all count as fittings. 4. Deposits are due at the initial fitting. The balance is due at final fitting or pickup, which ever comes first. 5. Missed Appointments: If you need to reschedule your appointments a phone call will be greatly appreciated. If you are running more than 15 minutes late, please give me a call. You may need to be rescheduled if someone is scheduled right behind your appointment. 6. Postponed weddings: Call as soon as you know the wedding is not going to take place. Unfortunately no deposits will be refunded if work has begun. If work has not begun a fitting fee of $35 will be charged and then the remainder the deposit will be refunded. 7. Abandoned garments: Every effort will be made to contact you several times by phone and then by mail. Your garment will be considered abandoned when it has not been picked up 6 months after the date on the ticket. "Having an alterations service policy has helped me maintain a good working relationship with my customers. Your cooperation will be greatly appreciated!" 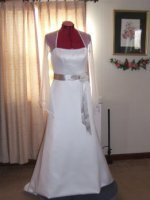 If you would like a price list for wedding dress alterations, make your request in the form below and it will be emailed to you.